Most scuba masks today have a silicone skirt incorporated with their design so that they can fit most faces, but that doesn’t guarantee a fit. The word “most” is the key part of that description. It’s guaranteed that there are scuba masks out there right now that don’t work with your face. Instead of wasting your money on a worthless mask, this guide will help you to find the best scuba mask that will actually fit. Price is not an indicator of quality when it comes to the modern scuba mask. Being leak-free and fog-free, however, are great indicators of quality. The best masks below will help you start to find one that provides the perfect fit. How Do You Find the Best Dive Mask? If you’re wearing a mask that is filling up with water in just a few seconds, then your day of water recreation becomes a day of water frustration. The skirt on the mask must be able to fully seal around your fast. There is never a mask that will fit everyone. It’s impossible to do. Never purchase a one-size-fits-all mask because you are bound to be disappointed. The first step is to use the reviews found here to select the mask that you believe is going to work for you. There’s no getting around trying it on. After ordering your mask online, you’ll want to test it out by using these 4 steps. Remove the strap or adjust it so that it is at its largest measurement. Water pressure is what will seal the mask to your face. Keep any hair out of the mask skirting. Then put the mask on your face so that it feels like it is centered. If you can’t get comfortable, then it’s time to return the mask already. Fit the snorkel in your mouth with the mask and then breathe in through your nose. If you’re getting a good seal, it will stick to your face as you’re breathing. If you breathe in too much, like take a deep breath, you’ll get inconsistent results. Adjust the strap so that it is pulled snug, but not tight. Hold your breath. If the mask stays put, you’ve got a winner. If not, then you’ve got a return on your hands. What Are the Benefits of a Good Scuba Mask? The best scuba mask is going to work with you throughout your entire swim. It should be stable and secure so that you can get the best views possible. That’s why taking the steps above is such an important part of choosing a scuba mask. It’s also why a $20 mask can outperform a $100 mask for some people. Here’s a Salty Dog pro tip: Before descending with your scuba mask, push it lightly toward your face. This will eliminate some air and create a good pressure seal. Water pressure will then finish the job for you as you descent. If you go down too far, the mask can squeeze you tight – make sure you can blow some extra air into it from your nose. The best scuba mask needs to provide you with a consistent level of visibility. It doesn’t matter what dive you’re planning. If the optical quality isn’t there, then there’s not point in owning that mask. What is great about this particular mask is that it has a lower overall iron content within the lens so that it is able to transmit more light. This reduces the amount of distortions that are seen when images are transmitted through them and eliminates some of the green tinting that can sometimes be a bit bothersome. These are perfect for free diving, fishing, or snorkeling. This patented mask is one of the best scuba masks around because it gives the diver a truly dynamic visual experience. Instead of being directly parallel to the face, there’s an inverted drop design to this mask that gives users a better view and a slim profile that won’t get in the way. With views up to 30% wider for the average diver and the ability to work with all different types of gear, there’s no denying how effective this mask happens to be and the price point is extremely fair to match. If you prefer a traditional scuba mask, then the user experience of this double lens model is one that you’re going to enjoy. The mask has been wade with tempered glass so that it has added strength without the problems that plastic can sometimes provide. The lenses have also been raked inward so that they are able to sit closer to the eyes than the standard mask. The unique inverted teardrop shape from Cressi has been incorporated into this mask as well so that users can get a better view of their environment. For a great price, you’re getting a great scuba mask right here. This scuba mask does a great job of being able to fit as many users as possible with the silicone skirt that has a double feathered edge. It’s ridiculously comfortable to wear and gives you a tight seal that can’t be beat. It’s available in clear or black options and the tempered front lenses are made from glass for added stability. There’s also a one-hand nose pocket that will let divers equalize the pressure for their ears as well. The low volume design helps the mask to fit snugly and the frame gives the diver a smooth profile. It’s definitely one of the diving masks available right now. The low profile of this scuba mask makes it one of the easiest on the market to clear today, but the good stuff doesn’t just stop there. The two-lens design is complimented with the option to get duotone colored masks so that divers can express their personality with a little extra style. The mask is designed to be a little smaller to provide extra comfort to those with smaller face shapes. It has an equalization nose pocket included within the design and ultimately provides a broad view without interruption. 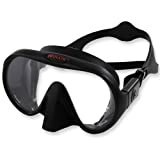 To find a great scuba mask, you need to have the best dive mask reviews. You’ll find those reviews, along with these tips, to be incredibly useful in order to find the dive mask that will give you a leak-free experience on every dive.